Despite PM Modi’s hopes, delinking Israel and Palestine in India’s foreign policy is easier said than done. Modi’s close ties with Israel can be traced to the period when he was the chief minister of Gujarat. Israel emerged as a key player in helping Gujarat achieve impressive economic growth under Modi, who often charted policy initiatives independent from the Congress-led UPA government at the center. Although the Modi government has asserted that India’s policy with regard to the Palestinian issue has not undergone any fundamental change, Modi’s engagement with the Palestine Authority has been limited. India’s Foreign Minister Sushma Swaraj made her own visit to Israel in January 2016. Her visit was part of the ongoing effort by New Delhi not only to broaden India’s relationship with Israel, but also to make it more public. The importance of Modi’s impending visit to Israel cannot be underestimated, as he will be the first Indian prime minister to visit the Jewish country. At a time when the Modi government has decided to end the previous era of behind-the-scenes relations with Israel, there is a growing demand that India should disconnect Israel with Palestine. 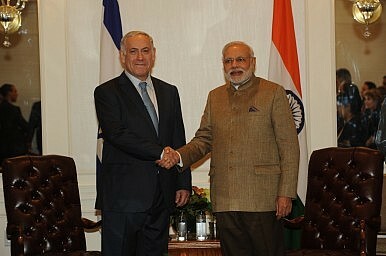 India always put conditions on rapprochement with Israel, based on progress in the Israel-Palestine dispute. Nonetheless, the first steps toward de-hyphenation were initiated in 1992 under the leadership of Narasimha Rao, when his government established full diplomatic relations with Israel. Since then, India’s relations with Israel have been gradually blossoming. However, the relations are not completely free from the ideological straightjacket and domestic political concerns. Previous prominent visits by top Indian leaders combined Israel and Palestine in a single tour. The visits of Union Home Minister L. K. Advani and External Affairs Minister Jaswant Singh in 2000, and S. M. Krishna’s visit as external affairs minister in 2012, were all described as regional since the ministers held meetings with both Israeli and Palestinian leadership during their tour. Union Home Minister Rajnath Singh’s visit to Israel in November 2014 was landmark in the sense that it was confined to Israel only. The omission of the Palestinian Authority from Rajnath’s tour was interpreted as the Modi government’s intent to break with the tradition of clubbing high-level official visits to Israel with visits to Palestine and Jordan. But the old policy staged a comeback soon and the Modi government began to balance India’s commitments vis-à-vis Israel and Palestine. Swaraj visited Palestine and Jordan, along with Israel, on her January 2016 trip. While in Ramallah, she emphasized that India’s support for Palestinians remained “undiluted.” President Pranab Mukherjee also went to Jordan and Palestine along with Israel in October 2015. In fact, he became the first foreign head of state to stay overnight in Ramallah. Modi has been quite open about wanting to develop a strong relationship with Israel. Following his election as prime minister, Modi was officially invited to Israel by Prime Minister Benjamin Netanyahu during their much publicized meeting at the UN General Assembly in New York in September 2014. When he met Israeli President Reuven Rivlin in March 2015 on the sidelines of the funeral of Lee Kuan Yew in Singapore, Modi confirmed his desire to visit Israel. Moreover, the overall climate in West Asia is relatively favorable and less hostile toward Israel, which is not being seen as the root cause of regional instability. The current mess created by the Islamic State has shifted attention away from the Israel-Palestine dispute and left India with an excellent maneuvering space, as most of the regional players are too busy with infighting among themselves and combating the jihadist juggernaut to seriously lose sleep over the first-ever visit to Israel by an Indian prime minister. Though he has not disclosed a specific timetable, Modi’s visit to Israel is a foregone conclusion. But a solo prime ministerial visit to Israel may not be possible due to host of factors. In spite of some favorable domestic and regional conditions, there are some factors that cannot be ignored by the Modi government before completely de-hyphenating India’s Israel-Palestine policy. Given India’s historical support for an independent Palestinian state, some have argued that a solo visit could seriously weaken India’s traditional stance. India has managed to preserve a pragmatic balancing act between regional players in the West Asian region. Beyond strategic relations with Israel, India cannot afford to ignore its crucial energy ties with Iran and the Gulf states. Furthermore, given the already strong nature of India-Israel bilateral ties, one could wonder what new tangible results Modi’s solo visit to Israel would be able to achieve. Also, there is always the risk that this move could be used against the Modi government during high-stakes state assembly elections in Uttar Pradesh, where India’s majority Muslim population lives. Elections in Uttar Pradesh in early 2017 could prove to be a real spoiler, in which the opposition parties, both regional and national, would feel tempted to indulge in ideological rhetoric against the Modi government. The government would not like to hear accusations that, as part of the anti-Muslim agenda of the BJP, the Palestinian cause has been totally abandoned. Another challenge emerging from India’s tilt toward Israel is New Delhi’s bid for permanent membership in the UN Security Council. Modi’s India, which requires firm endorsement of its candidature from the Arab countries that form a large group in the UN General Assembly, would not like to be seen as distancing itself from the Palestinian cause. In all probability, the Modi government will act cautiously in order to preserve vital strategic, economic, and energy interests in the West Asian region. Despite these factors, two recent events point to the Modi’s government’s major push in the direction of de-hyphenation. In April 2016, India, along with more than 30 countries on the UNESCO general board, had condemned Israel for its excavation and exclusion policies around the Al-Aqsa mosque and the Haram Al-Sharif. But when a similar resolution was put to vote in October 2016, India decided to abstain from voting. Since the text of the resolutions were almost identical, the only explanation for the change in vote is the Modi government’s subtle shift in policy. Top Israeli politicians and diplomats have been very candid about Israel’s close friendship with India, but their Indian counterparts have been quite reticent in demonstrating their country’s friendship with Israel. This favorable public reference to Israel makes Narendra Modi different from his predecessors in dealing with the Jewish state. There appears to be a link between these developments and a discernible shift in India’s Israel policy. Given this, the anticipation that Modi will succeed in delinking Indo-Israeli relations from domestic political concerns, and India’s relations with the Arab world, is not unfounded. Dr. Vinay Kaura is an assistant professor in the Department of International Affairs and Security Studies and Coordinator at the Center for Peace and Conflict Studies, Jaipur at Sardar Patel University of Police, Security and Criminal Justice in Rajasthan, India. Time for India to Play a Role in Israel-Palestine Peace? India, with its balanced ties to both sides, could be a yet-to-be explored path to peace.